Browse: Home / Network Monitoring Tool – a tool monitors whole subnets (IP-Address ranges) for hardware changes and vulnerability. Network Monitoring Tool is A simple network monitoring tool designed to notify the network administrator about changes and vulnerabilities. – monitoring: can be all (scan complete subnet for unkown devices) or list-only (only scan specified hosts). – exclude: must be an array containing at most vulnerability (skip vulnerability scan for this host) and mac (do not check if MAC address matches). 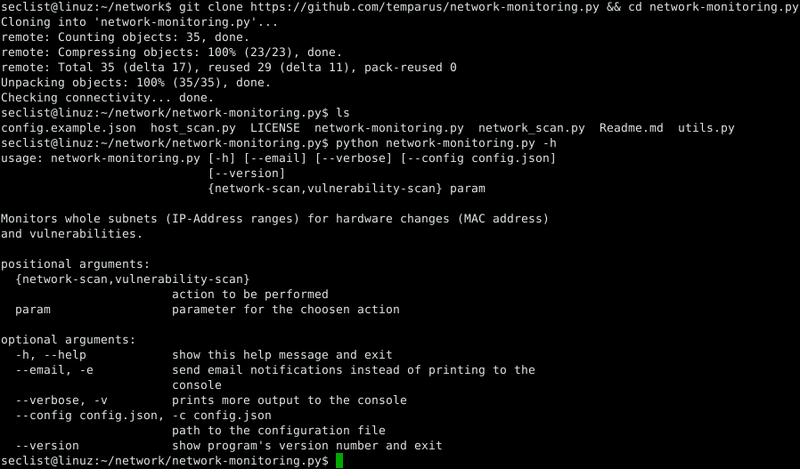 git clone https://github.com/temparus/network-monitoring.py && cd network-monitoring.py python network-monitoring.py -h Just copy the source files to a directory on your machine. Just copy the source files to a directory on your machine. ← DDOM or Daily Dose of Malware allows you to gather malware and c&c from open source intelligence.